Governor Charlie Baker Declares State of Emergency in Mass. Gov. Charlie Baker declared a state of emergency in Massachusetts Saturday afternoon. Governor Charlie Baker declared a state of emergency in Massachusetts Saturday afternoon, effective immediately. The declaration comes after the fierce early March nor'easter that slammed into New England with torrential rain, heavy wind gusts, coastal flooding and snowfall. Sarah White, from the Massachusetts Emergency Management Agency (MEMA), joined NBC10 Boston and necn by phone Saturday afternoon to discuss the state of emergency and the weather conditions in Massachusetts. "The declaration of a state of emergency in the case of this severe winter storm is really related to procedural emergency actions that need to happen, so declaring a state of emergency allows for the deployment of federal resources or resources from other states if we should need it," she said. "As we go into the recovery over the next several days, there might be additional resources that we'll need to either procure and buy or bring in from other states, so that declaration allows for the flexibility administratively for us to do those types of things." Massachusetts governor Charlie Baker asks people to stay off the roads as nor'easter continues to move through. "Right now the cleanunp efforts are minimal because we still have a lot of response efforts going on," White said. "We do have a lot of crews out on the field, on the ground, participating in power restoration where it's safe to do so. We have a lot of crews as well assisting in evacuations in flooded areas. There are still areas we haven't even been able to get to do damage assessment at this point." On Thursday, Gov. Baker signed an order to activate the National Guard to assist local police and fire departments with evacuation and rescue efforts. The National Guard mobilized 53 vehicles to various cities, towns and strategic locations throughout Eastern Massachusetts. Friday night, Gov. 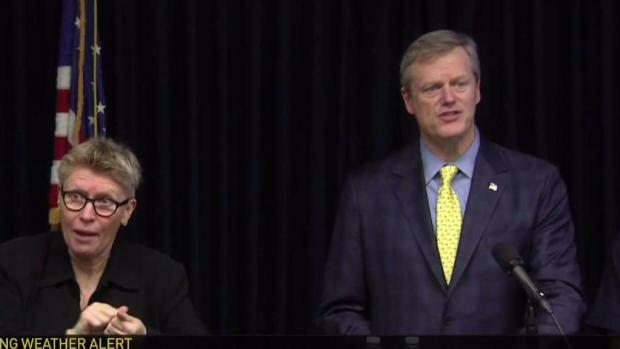 Charlie Baker urged people in coastal communities to get out if they have been asked to do so by officials. The state of emergency will remain in effect until Gov. Baker issues notice that it is no longer necessary. There is no statewide travel ban associated with this state of emergency. "We want people to know that if they need to leave their home and go to a shelter, that there are shelters available and open for people," White said. "Make sure that you check on your neighbors and your friends. This is something where we need to come together and take care of one another." MEMA will continue to work with municipalities and state agencies to plan for the remainder of this storm and coordinate assistance for the cleanup efforts to come. 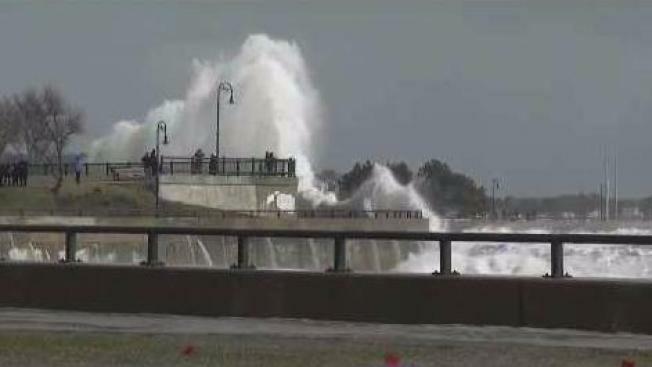 Communities in Massachusetts had declared state of emergencies as residents across the state lost electricity on Friday. State of emergencies were declared in Marshfield, Duxbury and Scituate, where officials had long-warned of coastal flooding due to high tides. The neighboring town of Norwell also declared a state of emergency after nearly 100-percent of its residents lost power.